The Jens Soering case provides an intriguing test of Virginia’s post-conviction review options. Mr. Soering is serving two life sentences in connection with the 1985 Bedford County murders of the parents of his then-girlfriend, Elizabeth Haysom. The case was sensational at its time, because of the bloody and brutal nature of the murders, the fact that both Mr. Soering and Ms. Haysom were University of Virginia students and the international interest generated by the because Mr. Soering’s father was a diplomat from Germany and the couple fled to England and had to be extradited. Coming into play, if obliquely, is Virginia’s post-conviction program. For far too long, Virginia’s ability to consider fresh evidence following a conviction was abysmally inadequate. Even death-row inmates had only 21 days after conviction to produce new evidence of their innocence. A governor could commute the sentence, but the innocent person could not be proclaimed innocent, since no court would reconsider an old case. Then came the widespread use of DNA evidence, which was able to prove beyond a shadow of a doubt that in some cases convicted “criminals” were, in fact, innocent. Virginia finally modified the law to accept such evidence under certain restrictions. Now, in light of new DNA evidence, Mr. Soering’s lawyer has asked, not to have the evidence reviewed by a court, but rather to have Gov. Bob McDonnell support paroling her client and deporting him to Germany. Yet, it does not prove his innocence. The public is used to more conclusive results from DNA. In most cases where DNA has exonerated a wrongfully convicted person, it is because the evidence identified a different perpetrator or, at least, excluded the accused. That hasn’t happened here. But testing has eliminated Mr. Soering and Ms. Haysom as sources of some of the DNA evidence. Other samples could not be tested, and still others did not provide enough detail to be useful. It is surprising that Mr. Soering’s DNA was not found on any of the 42 samples that were submitted. Does that mean he and Ms. Haysom were never at the scene? Or does it mean that police just happened not to collect their DNA? Or, might their DNA be found on the other samples, if they could be fully tested? As for those samples that clearly did not match their DNA … whose DNA is it? To complicate matters further: At the time of his interrogation, Mr. Soering confessed to the murders. He has since recanted, saying he wanted to take the blame to save Ms. Haysom, under the belief that his father’s diplomatic status would protect him. Today, his lawyer isn’t asking for a court to reconsider the verdict, as revised law was altered to allow — doubtless because results are so inconclusive. 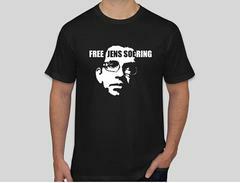 But she and her client do think enough doubt has been raised to warrant releasing Mr. Soering. This case doesn’t fit neatly into any parameters, nor does it follow any obvious precedent. But it does show how DNA evidence can be considered — or proposed for consideration — simply to raise reasonable doubt after conviction. Such ambiguity is not what the revised law was intended to address. The governor now has a challenging decision to make — and one that might set a direction for future decisions as well.